Crosby vs McDavid: What a Night! - The Point Data-driven hockey storytelling that gets right to the point. Crosby vs McDavid: What a Night! We only see it twice a season, but Round 1 of McDavid versus Crosby did not disappoint. A couple of points for Connor, who set season highs in a number of areas – we’ll get to that in a second – and a couple of goals for Sid, including an OT winner that twisted Ryan Strome into a pretzel. As soon as Crosby scored, my Twitter timeline was flooded with posts all saying essentially the same thing – I guess we know who the best player in the world is. Recency bias at its finest:) But this isn’t an article about who’s better, it’s a celebration of two of the best players the game has ever seen and a look at their unique but very different skill sets. 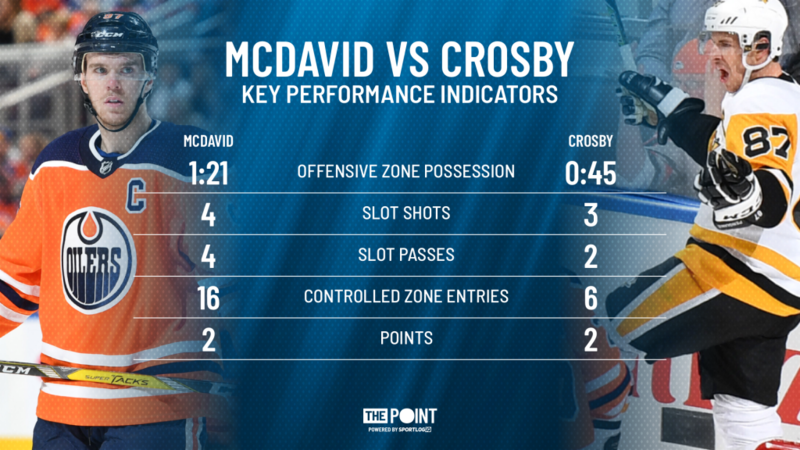 When you look at some of our key offensive performance indicators, you’ll see the same thing we’ve seen in most McDavid versus Crosby match-ups – McDavid with the edge in individual metrics, Crosby with an edge in likely the only stat he cares about, the win column. Crosby and the Penguins are now 5-0-0 in head-to-head match-ups against McDavid’s Oilers. To me, this graphic captures the very essence of the McDavid vs Crosby debate as to who the best player in the world is. It’s not a right or wrong question, it’s a matter of how you define “the best.” McDavid is the most skilled player in the world in the sense that he can operate, fully functional, at a speed no one else can – or ever has. There have been players as fast as McDavid; there’s never been a player who’s hands and brain move as fast as his feet at the speed McDavid plays at. This shows up in the season-high 18 controlled zone exits he had last night and the season-high 16 controlled entries. If your definition of ‘best player in the world’ is who has the greatest individual skill set, then McDavid is the best player in the world. Crosby has an equally unique, albeit very different skill set. There isn’t a player in the game who elevates those around him in the way Crosby does. Every coach Crosby has played for has said the same thing – Sid is the most driven athlete I’ve ever been around. He’s also insanely talented and he reminded us of that with his deflection goal in the 1st period and, of course, his ridiculous OT winner. There’s a reason Crosby has won multiple Cups and multiple Olympic Gold medals, playing a significant role in every one of those championships. He makes everyone around him better. Whether you’re a superstar, a role player or a guy fighting to stay in the line-up, when you see Crosby outwork everyone else, every day, you’re forced to raise your effort level, every day. Crosby is a winner who elevates those around him and if that’s your definition of ‘best player in the world’, then Crosby is the best player in the world. 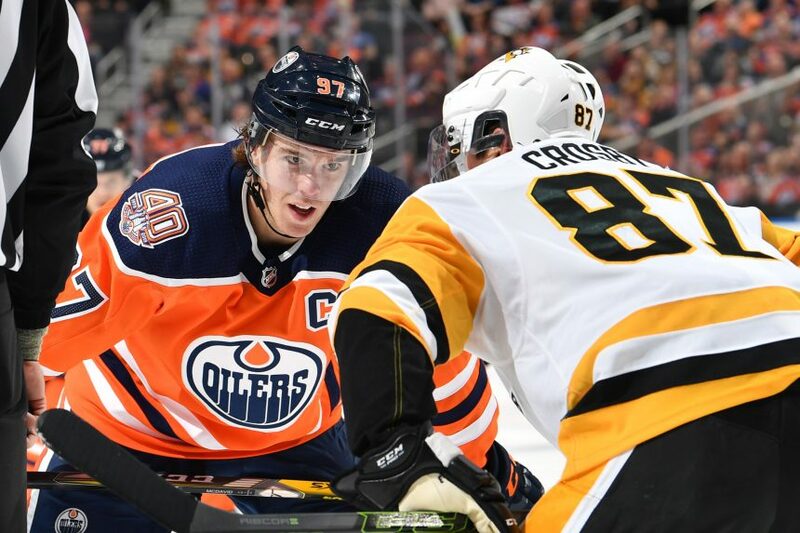 It’s a fun debate and as I said, I think it’s less a matter of right or wrong and more how you choose to define ‘the best.’ Most people said McDavid at the start of the season and after last night, it seems the pendulum of popular opinion has now swung in Crosby’s favor. I know this may sound borderline pretentious but, honestly, I’m good with just appreciating these guys for their generational and very unique talents. ‘Sid the Kid’ is already in his 14th season, crazy, right? Who knows how much longer he can stay in the debate but he showed last night he’s not going anywhere, anytime soon. What a game!